In the video clip below from Complete Track and Field Coach Scott Christensen suggests common training markers you can use to gather quantitative and statistical data to measure the fitness of your cross country runners. Whether it’s lactate levels, economy running, heart monitoring or basic 400m runs, Christensen details the benefits of each marker that can be used throughout cross country training cycles. Coach Christensen is an acclaimed distance coach. His high school teams have been ranked in the national top 10 eight times. He has coached 13 Minnesota State Championship-winning teams and 27 individual Minnesota State Champions. Coach Christensen has also spent 14-years as a USATF Level II endurance lead instructor and currently serves as lead endurance instructor for the USTFCCCA Coaching Academy. 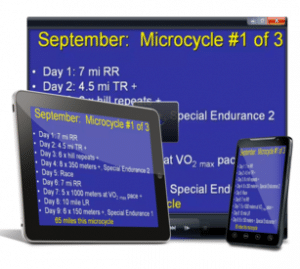 Coach Christensen suggests using vVo2 max pace as the marker for your aerobic training. Heart rate monitors that are properly calibrated for each individual runner are also useful tools, but he prefers vVo2 max, the two mile test, and fractionalizing that for different workouts. He prefers using fractionalization of the date pace 400 for anaerobic training maker. He also suggests updating their 400 time frequently and adjusting the workouts accordingly. Coach Christensen has produced a Complete High School Cross Training Program that provides an incredible amount of training for high school distance coaches for more information about that program you can click on the link above. Coach Christensen has also provided a coaching cheat sheet to us for FREE. Just click THE ULTIMATE WORKOUT PLANNING GUIDE FOR HIGH SCHOOL CROSS COUNTRY for more info and you will be able to copy and paste 33 of Scott Christensen’s proven training progressions when you need a perfect workout! A big thanks the Coach Christensen for the generous offer. Training a distance runner properly requires and thorough understanding muscle physiology. We must train two different energy systems and understand how they work together to power our bodies so that we can design the most effective workouts. If your background is not is physiology or exercise science, you might want to turn to some experts that can help you become a little more scientific in your training. 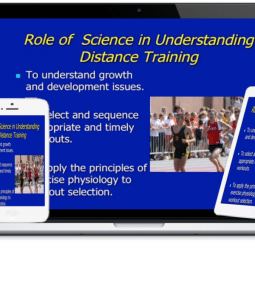 In the first of two clips below renowned distance coach Scott Christensen discusses issues related to fatigue in distance runners. Coach Christensen states that training to delay fatigue will improve performance . He believes that all other factors being somewhat equal, fatigue will determine winners and losers and finally the athletes with the greatest ability to manage fatigue are the ones setting all of the records. In the second clip he discusses proper rest intervals during workouts and how to adjust them as the season progresses. Generally speaking he believes they should be shorter early in the season and longer as the season progresses. Exactly the opposite of what one might think. For those of you unfamiliar with Coach Christensen his high school teams have been ranked in the national top 10 eight times. He has coached 13 Minnesota State Championship-winning teams and 27 individual Minnesota State Champions. Coach Christensen has also spent 14-years as a USATF Level II endurance lead instructor and currently serves as lead endurance instructor for the USTFCCCA Coaching Academy. The YouTube videos below have audio, so please make sure that your sound is turned on and that you have access to the site. Please note that some schools block access to YouTube. When planning the training for distance runners there are a lot of factors to take into consideration. Whether it is balancing tempo runs with speed workouts, or working on their form and posture, as a coach you are always trying to gain an edge. How can we train our runners so that we cut time, reduce injury and keep them motivated. One often overlooked area that can help distance runners is improving their balance. Running is an activity that demands that the athlete be on one foot while performing. Therefore it is critical that they have the necessary strength and balance needed to stabilize their foot on each strike. In reality a runner requires just fractions of seconds to stabilize on each foot strike. If you consider the thousands of foot strikes required in training and racing, improvement in this area will not only reduce injury but also have effect on their performance. In the video clip below Ryan Warrenburg, strength coach at Zap Fitness Team USA Training Center, demonstrates some very simple exercises that he incorporates into each of his workouts with his distance runners. These are simple exercises that can be completed easily outside of the weight room. The YouTube video have audio, so please make sure that your sound is turn on and that you have access to the site. Please note that some schools block access to YouTube.